I have thee lithographs showing here. Hong Kong Open Printshop promotes the art of printmaking by curating exchange exhibitions, conducting educational programmes and showcasing Hong Kong printmaking at international symposiums. As an international exchange programme, Hong Kong Graphic Art Fiesta connects national, regional and international art communities. The programme began in 2007 with the opening of the first Hong Kong Graphic Art Fiesta. The feature events that year were “Crossing Boundaries – an International Print Exchange Exhibition” and “Hot Off the Press”, an exhibition of print art by students from local universities and tertiary institutes. The Hong Kong Graphic Art Fiesta has become a major international graphic art exhibition, Crossing Boundaries featured the work of 100 artists from 12 print workshops. Prints from mainland China, Hong Kong, Macao, Australia, Bangladesh, Brazil, Canada, Ireland, Luxembourg, Portugal, UK and the USA illustrated the diversity of contemporary printmaking practice, highlighting both thematic and cultural issues as well as more pragmatic matters such as media, technique and format. By 2010, the Hong Kong Graphic Art Fiesta had developed into a major annual international printmaking exchange exhibition with three main areas of focus – work by established printmakers, work by university students and work by secondary students – rotating every three years. The festival is now two months long and the number of workshops and participating artists has multiplied enormously. 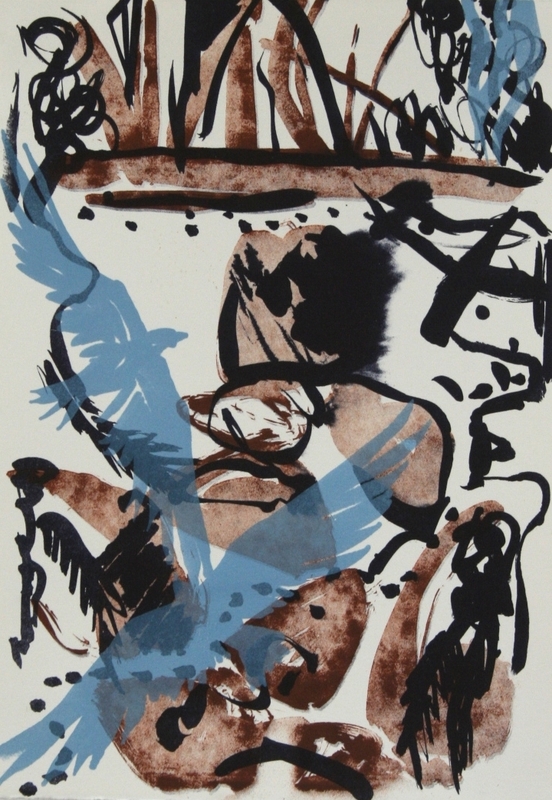 This year the portfolio Collaborations : Aberystwyth Paper Press Print, compiling 30 artists associated with Paul Croft Master Lithographer and the Aberystwyth Print Workshop was to go on show at this impressive event. 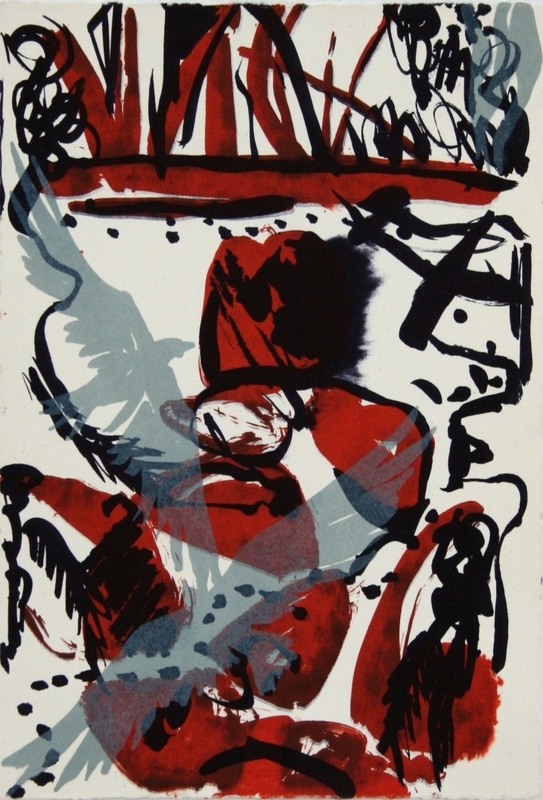 The prints were executed in a variety of media – lithography, etching and aquatint, mezzotint, woodcut, linocut and monoprint – have since been acquired for the Archive of the Hong Kong Arts Centre. 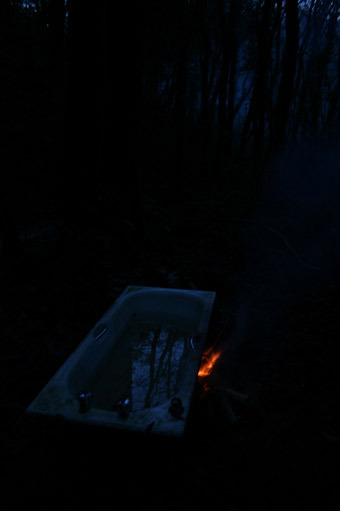 Artists included are Wuon Gean Ho, Edwina Ellis, Paul Croft, Ruth Jen Evans, and Marcelle Hanselar. To connect national, regional and international art communities through international exchange exhibitions and educational programmes. To establish a multi-disciplinary platform for promoting Hong Kong printmaking. To share the joy of making art with the general public by offering a diverse range of creative programmes. To support new talent by offering internship and residency opportunities for young artists. 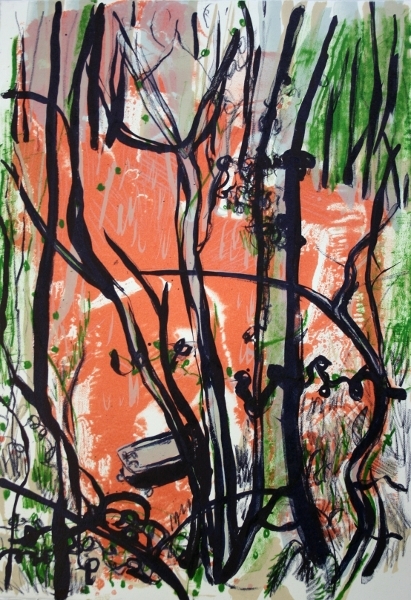 This lithograph, Woodland Bathing, made in 2012 in the Aberystwyth School of Art print room, is included in the exhibition. The exhibition is at the HONG KONG OPEN PRINTSHOP in October 2013 – exact dates TBC , images can be see at Art Fiesta. My latest lithographs are to be seen in Belgrave Gallery’s Summer Exhibition. The gallery has an interesting mix of three different exhibitions. Three ‘themes’ titled ‘CONTEMPORARY ART Summer Exhibition 2013‘, ‘MODERN ART Summer Exhibition 2013‘, ‘TRIBAL ART Summer Exhibition 2013‘. The prints are titled Raven Fingers Pointing Call All. They are two in an edition of four different lithographs, made by preparing five different stones and printed on paper with different combinations of colours in different orders. The prints below use four and three stones consecutively. 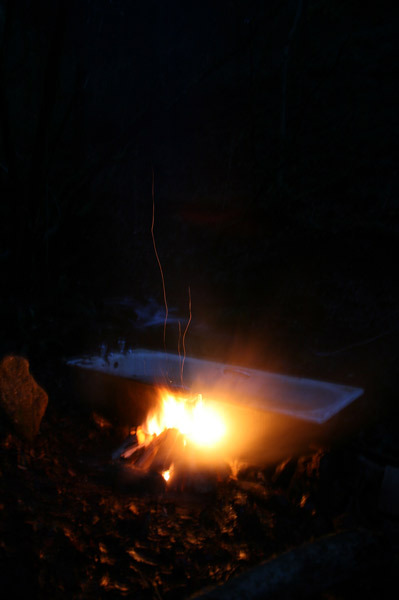 The title comes from the line of a poem titled ‘Under A Northern Sky’, written in Sheltand during a residency I undertook in 2006. An exciting project and something which I am very proud to take part in is Collaborations: Aberystwyth Paper Press Print. It is a portfolio which has been put together by Master Printer Paul Croft TMP (Albuquerque) RE and was completed at the end of last year. On his web-site Paul describes it as ‘a portfolio celebrating the diversity of printmaking from traditional to digital. Each of the 30 professional artists, staff and students participating in this project have had contact with the print studio at The School of Art Aberystwyth between 2000-2012. Artists have been encouraged to be experimental and processes include combination of print media, traditional and digital processes, hybrid prints as well as more inter-disciplinary activity such as prints developing from photography, film and video. Artists were also asked to reflect upon their own practice and to produce a print that is representative of their current work’. A few names to ring out are: Wuon Gean Ho, Shani Rhys James, Edwina Ellis, Paul Croft, Ruth Jen Evansand Marcelle Hanselar. 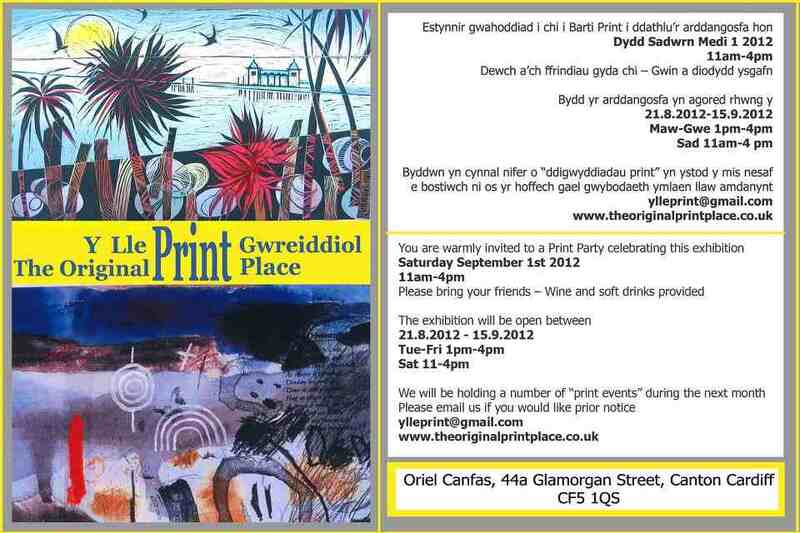 The first exhibition where Collaborations: Aberystwyth Paper Press Print will show is at IMPRESS 13 , an international printmaking festival showing in various venues in Stroud, Cheltenham and the Cotswolds. I am also showing at IMPRESS13 with Aberystwyth Printmakers and feature in the wonderfully produced festival catalogue on the Aberystwyth Printmakers page. 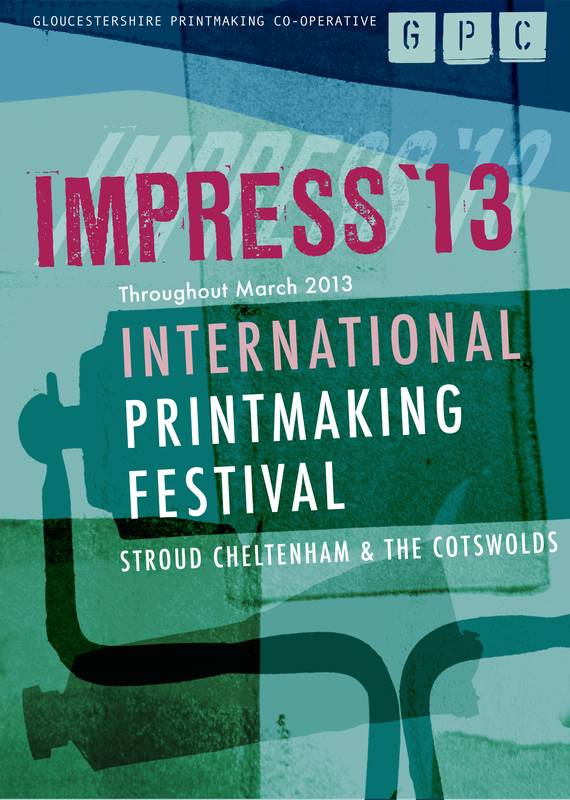 For more information on the printmaking festival visit IMPRESS13. Now online, see Cardiff print-workshop’s FB page. Looking across the horizon west last night and towards Strumble Head, the half moon shines on the sea and is then engulfed in a cloud that it makes black in the dark blue sky. The sea is a grey blue and the moon’s reflections dance on it like a hologram separate to the waters surface. The holographic silver shapes become vertical; lift, tilt and dance.